Our hotel offers a unique and inviting Northwoods atmosphere. 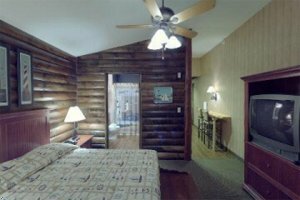 Large enough to offer numerous enjoyable amenities for family and business travelers alike, Stoney Creek Inn also maintains an at-home log cabin feel. You can look forward to a refreshing swim in the indoor/outdoor swim-through pool or simply relax in our giant hot tub or sauna. The large variety of breakfast items served on our continental breakfast spread is a great start to any day. A fitness center available 24 hours a day and high speed internet access in every room keep activities going 'round the clock at Stoney Creek Inn. Families find our novel bunk bed rooms a perfect fit while away from home. Corporate travelers can pamper themselves with a stay in one of our executive rooms, complete with a massaging recliner. For those looking to really get away from it all, choose from one of our themed suites with stone fireplace, sitting area, and whirlpool tub. Standard guest room with king bed or 2 double beds. Room includes coffeemaker, hairdryer, iron/board, Northwest decor, and high speed internet access. Superior guest room with king bed, or king and 2 bunk beds. Room includes microwave, refrigerator, large screen TV, coffeemaker, hairdryer, iron/board, Northwest decor, and high speed internet access. Some rooms with jacuzzi and massage recliner. Deluxe guest room with king bed or 2 double beds. Room includes microwave, refrigerator, large screen TV, coffeemaker, hairdryer, iron/board, Northwest decor, and high speed internet access. Premier suite with king bed. 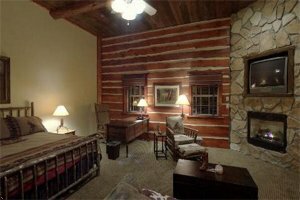 Suite includes private jacuzzi, spacious sitting area with stone fireplace, microwave, refrigerator, large screen TV, coffeemaker, hairdryer, iron/board, Northwest decor, porch, and high speed internet access. Extended stay junior suite/cottage with queen bed. Ideal for extended stays or for a few days. Suite includes full cooking kitchen, sofa sleeper, balcony, separate TV area, spacious closet, microwave, refrigerator, coffeemaker, hairdryer, iron/board, Northwest decor, and high speed internet access. King whirpool suite with king bed. All suites include jacuzzi, fireplace, TV, refrigerator, coffeemaker, microwave, double sofa sleeper, spacious bathroom, ceramic tiles, brass fixtures. STANDARD KING WITH HIGH SPEED INTERNET, COFFEE MAKER , HAIR DRYER AND IRON AND IRONING BOARD. From the airport, go north on 63, take A/C west to South Providence. Turn right (north), go 2 blocks, hotel is on left. Nine meeting rooms are available for use, please contact the inn for additional information.